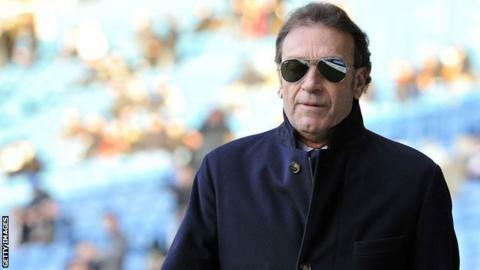 Leeds United owner Massimo Cellino has lost his appeal against the Football League's decision to disqualify him from owning the club. He was disqualified in December after the League obtained documents from an Italian court, which had found Cellino guilty of tax evasion. The 58-year-old Italian is prohibited from having anything to do with the running of the club until 10 April. Leeds are currently 20th in the Championship. The Professional Conduct Committee set up by the Football League to hear Cellino's appeal against the decision ruled that the verdict of the Italian court was for an act involving dishonesty, which is a disqualifying condition under its owners' and directors' test. "The Football League will want him to step down in two days and we're not quite sure what that will mean. Will he have to put his shares into his wife's name or will he have to sell the club? We'll have to wait and see. "It looks like they will try to fight this and move forward but it leaves Leeds in a precarious position. They are in unchartered territory right now. "He'll be able to come back but we don't know whose hands he will put the club in in the meantime." The Football League said in a statement: "We consider that the judge's findings of fact and her description of Mr Cellino's state of mind based on them, is of conduct which would reasonably be considered to be dishonest." Leeds chief operating officer Matt Child told BBC Radio Leeds that the club were "surprised and disappointed" with the verdict and "would continue to take legal advice". He said: "It's very early days for us and we will be talking to the lawyers about our opportunities. "We've got lots of very good people with us and we will be liaising with the Football League and their legal team to see what the potential outcomes could be for Leeds United. We will be as compliant as we need to be. "Massimo feels like he has been invited to a party and when he has shown up he hasn't been allowed in." GFH Capital, who have a 25% stake in the club, have echoed Child's sentiments. They said in a statement: "We fully support his, and the club's, actions to get this finding overturned, and will continue to do so. "We remain committed to the best interests of Leeds United and these will best be achieved with Massimo's suspension being lifted as soon as possible." Cellino, who took over at Elland Road last April, will be allowed to resume his role after 10 April as his conviction will be deemed to be spent. Meanwhile, the club are currently under a transfer embargo for breaching Financial Fair Play rules, and cannot pay any transfer fees for players in the current window.